Steven Boutelle, U.S. Army (Ret), is CEO of Cisco IRIS and charged with leading Ciscos Internet Routing in Space initiative to extend the information transport power of the Internet into space, integrating satellite systems and ground infrastructure for commercial and government users who need anytime, anywhere IP-based data, video, voice and mobile communications. Boutelle is also Vice President of the Global Government Solutions Group (GGSG) at Cisco Systems, where he leads a business development team that advises government customers on business practices and technology solutions to achieve and enhance their mission goals. Prior to joining Cisco, Boutelle served as the Chief Information Officer of the U.S. Army, responsible for the Services worldwide use of information technology. He introduced converged voice, data and video to the Army, building an enhanced network infrastructure to serve 1.9 million users. Boutelle established an industry recognized portal, the Army Knowledge Online, and the Defense Knowledge Online to provide streamlined access to content for six million defense users. Through an IT portfolio management program, he reduced the costs of IT systems and applications by half. He is a recognized leader, technology evangelist and mentor. His career in the U.S. Army is marked by a consistent record of driving the adoption of new technologies and streamlining processes to improve productivity and enhance collaboration. He led the U.S. Federal Government in implementation of Secure Network Logon with 98 percent of 1.2 million Army users adopting Common Access Cards. He also led compliance with the U.S. Office of Management Budget criteria and the Presidents Management Agenda, with 100 percent compliance for two years. General, would you please offer our readers information regarding your background and why you selected the U.S. Army as your career choice? In 1969, I was drafted during the time of the Viet Nam war. Instead of allowing others to determine my fate, I selected the Army and enlisted for three years. During my enlistment, I was selected to participate in Officer Candidate School, and, well, the rest is history. For 38 years, I had the honor of serving my country. Even though I started my military career as an artillery officer, my lifes passion was, and still is, electronics. In college, I studied electrical engineering and as my military career progressed, I served as a communications officer in a number of Signal Brigades. The acquisition and development of technology became very important to the military as it modernized in the 80s and 90s. To support this mission, I built and acquired communications technology for satellite, ground, logistics, intelligence, and personnel and missile and other types of systems. While I loved the technical side of my job, I never forgot that my ultimate goal was to provide the warfighter with the technology needed to save lives and complete the mission. Starting in July of 2003, you were the CIO for the Army... what missions did this command role entail? The ultimate responsibility of CIO/G6 of the Army is to provide a reliable and secure network that gives civilian and military leadership access to the information it needs for time-sensitive decisions. This is especially critical in the Global War on Terror where commanders must make immediate decisions based on real-time intelligence. Given the reliance on information, the CIO/G6 now reports directly to the Secretary of the Army and Chief of Staff of the Army. From a technical perspective, the CIO/G6 has become a critical position within the Army as it continues to support the Army Knowledge Enterprise (AKE). With more than 17,000 men and women in its command, as a Direct (DRU), or Acquisition Organization, it is responsible for operating the Army network around the world. In addition to maintaining the network, the CIO/G6 has oversight responsibility for acquisition of all fixed communications systems. During my tenure, we were focused on battlefield communications support. As the country waged two wars and operations continued in support of the Global War on Terror, collaboration and actionable information were essential to completing the mission. For the first time, we were providing voice, data and video communications in real-time to people separated by thousands of miles. Among the many initiatives we undertook, one of the most significant was the move to Everything Over IP (EOIP). As I visited the units preparing for the Iraq war, I found that the lack of policy was making the move to IP sub-optimal. A number of the Army Divisions were taking matters into their own hands and using discretionary funds to develop and run their own EOIP communications networks. To support this natural evolution to IP, I made a push to deploy the Joint Network Node (JNN). The JNN is the Armys first deployable IP-based converged communications system that can support voice, video and data communications on the battlefield. What do you see as some of the obstacles to moving to EOIP? There is not a set policy for the services to go to Everything Over IP. Instead, you see more of a generational influence on the communications equipment being installed or deployed. For example, some camps are continuing to install circuit-based equipment, not because that is the best solution, but because that is what they are most familiar with. This can lead to dead-end investments and an inability to migrate to newer technology. Another obstacle is complexity. As systems increase in functionality, they often increase in complexity as disparate components must be integrated and configured. This complexity typically requires a highly technical, highly trained individual. However, having adequately trained personnel available to operate these solutions becomes a challenge. Sophisticated system software, such as those driven by powerful wizard interfaces, can reduce the complexity of the solution and make difficult tasks easier to execute with fewer errors. Acting as a force multiplier, system software can enlarge the pool of personnel that can be rapidly trained to effectively operate a highly advanced communications system. In a tactical environment, quickly and accurately establishing situational awareness is critical to mission success. Software can also assist in monitoring the health of the components within the solution, so that trouble-shooting issues can be addressed quickly and confidently by examining log databases, thus reducing the amount of downtime. How can the private sector assist with the development of a variety of solutions for military communications? Almost everything being used is commercial. The commercial sector must understand that systems need to be Joint Interoperability Test Command (JITC) compliant to get implemented. If you are a vendor you have a duty to not only meet the requirements, but go through rigorous testing to become fully certified. This is how the military ensures its systems are interoperable between the services. How does the U.S. Armys Command and Control rely upon MILSATCOM for the implementation of communications? The use of satellite communications by the military is critical. We fight in areas like the Middle East, where there is little to no communications infrastructure. Without satellites, these missions would be incredibly more difficult to undertake. Today, more than 94 percent of military satellite communications in the Gulf are done over commercial satellites. With the cancellation of the Transformational Satellite Communications (TSAT) System, we are looking at another decade of dependence on commercial satellites as our primary source of communications. In addition to commercial satellite capacity, the US needs dedicated satellites that are completely secure and hardened against attacks. Was the transition from command in the U.S. Army to that of the private sector difficult to accomplish? Could you define your executive responsibilities as the Vice President for Ciscos Global Government Solutions Group? 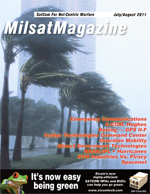 Do you see Cisco as becoming more involved in MILSATCOM, and creating what effect? The transition from the Army to the civilian world was not a difficult one for me. The last 15 years of my career was spent working closely with the commercial sector to develop the Armys latest communications systems. It did take me some time to understand what drives the commercial sector though. In the military, especially at the CIO/G6 level, you have a tremendous amount of responsibility in terms of people and tax dollars. On the commercial side, companies work hard to build great products for the military, but they must also focus on making a profit and generating value for employees and the shareholder. In the end, people in the military and commercial sectors both want to do a good job that helps the men and women of the armed forces accomplish their mission as safely and effectively as possible. Currently, I am the CEO of Cisco Internet Routing in Space (IRIS) and charged with leading Ciscos IRIS initiative to extend the information transport power of the Internet into space, integrating satellite systems and ground infrastructure for commercial and government users who need anytime, anywhere IP-based data, video, voice and mobile communications. I am also the Vice President of Business Development for the Global Government Solutions Group (GGSG) at Cisco Systems, where I lead a business development team which advises government customers on business practices and technology solutions to achieve and enhance their mission goals. Cisco has been working within the MILSATCOM area for some time now. Cisco is driving the next generation of IP-based solutions for the satellite market to support warfighter, consumer, SMB, Enterprise, and Government applications in the mobile, fixed and Broadcast Satellite service space. IRIS is an extension of these ground based solutions, providing a next generation merged ground-space architecture to drive new opportunities, services and capabilities. IRIS extends the power of the Internet to provide multi-service networks and personalized rich media through space by integrating satellite systems and ground infrastructure for commercial and government users who need instant, seamless, global, broadband communications. What advice do you have for organizations that are waiting to transition to IP? Dont wait! For those organizations entrenched in older technologies, I would recommend they pursue a migration strategy that enables them to leverage their current investment, but start the transition to newer, IP-based technologies. A hybrid TDM-IP voice switch, for example, would provide a bridge from TDM technology to full IP. There is no need to wait for another generation of IP solutions, such as Local Session Controller (LSC), to be launched in the marketplace. Its important to take the first steps now. Second, I have already mentioned that IT has become a world of convergence of voice and data. As a former CIO of the Army, I also saw a convergence occurring across tactical and strategic operations. The communications across the two is becoming seamless, and people at the base need to readily communicate to individuals in the battlefield. This requirement of seamless communications can be facilitated by leveraging a common communications platform across the entire network, both voice and data. The converged IT network is here today, and I would encourage teams to embrace it and take advantage of the powerful capabilities that come along with unified communications.